Not all of them. Claude Bernard realized that nothing that could happen in the street would be as revolutionary as the results from his experiments on digestion in dogs. He had found sugar in a dog that he had been dissecting. But the dog hadn’t been fed any sugar. Where did the sugar come from? At the time, everybody assumed that any sugar in an animal came from their diet and that the sugar would ultimately be destroyed by oxidation. Animals eat sugar (or any food) for energy and the energy comes from oxidation of the food just as if you were burning food in a furnace. The dog hadn’t eaten any sugar. Strange as it seemed, the only possible explanation was that the dog was making its own sugar. It must have been making sugar from something else. This was a revolution. Animals burned their food for energy. Lavoisier showed that. More than 100 years before the Second Republic he had built a whole animal calorimeter, a device that measures the heat generated by an animal. He showed that food was burned in an animal in roughly the same way that metals or other substances are oxidized. — quoted by F.G. Young. It took some doing to show that the sugar was actually being produced in the dog’s liver but, by 1857, Claude Bernard had isolated the matière glycogene, what we call today glycogen. We understand its structure, as Bernard didn’t — it is a polymer of glucose, highly branched, highly structured. — it is a storage form of carbohydrate which allows glucose to be mobilized when needed and supplied in the blood. Figure 3. Structure of glycogen. 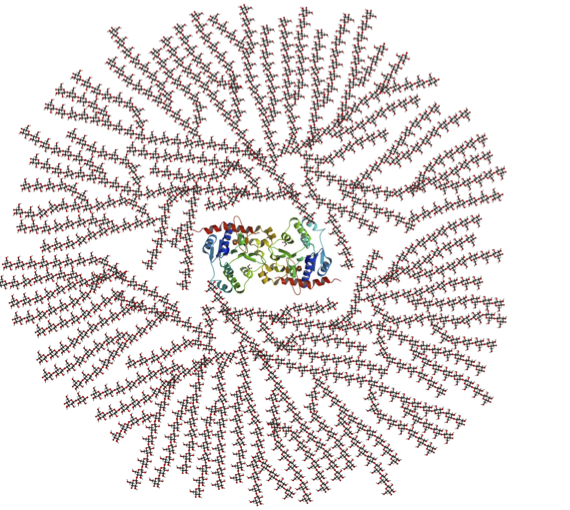 Each of the small units is a glucose molecule which can be clipped off from the end of each chain. The structure is highly branched (has a lot of ends). The multi-colored object in the center is the protein glycogenin around which the molecule is built. Bernard emphasized the supplier idea, its ability to provide glucose to the tissues. He was not clear on how it got there. We now understand that sugar that we eat can be burned for energy or can be stored in glycogen. Most people are familiar with “carbohydrate loading” before a marathon, the pasta and beer dinner that will build up glycogen (at least if you just practiced by running a half marathon) and that that will support greater endurance (depending on what else you’ve been doing). But, of course, Bernard’s dogs hadn’t eaten any sugar at all. He knew that glycogen didn’t come from fat but, in fact, feeding protein seemed to be even better than feeding sugar (he used fibrin, the blood coagulation protein). The picture that evolved at that time, not quite correct, was that protein was the source that supplied glycogen which, in turn, could produce glucose, although, in 1858, it was unknown how this could be accomplished. Today, we emphasize the need to keep blood glucose constant; we understand that almost all cells in the body use glucose as an energy source so too little is not good. It turns out that too much is also not good because glucose has some chemical reactivity and will react with proteins in the blood and in the tissues to form what are called advanced glycation end-products or AGEs. The liver is a kind of command center for metabolism. The liver takes up glucose when blood levels are high and releases glucose from glycogen if levels fall. The liver is also the major site of the process is known as gluconeogenesis (GNG) whereby new glucose is made from other metabolites mostly amino acids from protein. GNG will also replenish any glycogen that is used up. In some sense, Bernard had discovered at least the idea of gluconeogenesis, (which would not be clearly demonstrated for another hundred years) even though in his animals, most of the glucose was coming from glycogen. We now understand that the immediate source of blood glucose is usually from glycogen although GNG is going on almost all the time (contrary to the suggestion in some textbooks that GNG is a last-ditch effort after glycogen is gone). In other words, glucose made in GNG may be in the form of the metabolite glucose-6-phosphate (G-6-P) that can go into synthesis of glycogen and only later appear in the blood. The bottom line: glucose uptake into the liver, glucose release into the blood, glycogen synthesis and breakdown and gluconeogenesis all go on at the same time, are directly connected. It is really all one process defining blood glucose control (Figure 5). Figure 5. Components of Hepatic Control of Blood Glucose. It’s more than basic physiology. Control of glucose production, glycogen metabolism and GNG are right at the center of the confusion in nutrition and dietary recommendations that we confront today. For forty years, we focused on the supposed dangers of high dietary fat and it was absolute dogma that fat, or at least saturated fat, and cholesterol were unambiguous risks for cardiovascular disease. (Supermarkets are still stocked with low-fat, cholesterol-free producta which are “healthy,” “smart,” and “lite” (which foreign students think is how you spell “light.”) The possibility that the real problem was the excesses of the dietary carbohydrate that replaced the fat was rejected and the implication arose that somehow there was a requirement for carbohydrate. Fat and carbohydrate is what it is all about. So, how much carbohydrate do you need? How much do you need to eat to survive and how much to be healthy? We now understand that animals (including humans) don’t need any carbohydrate. Whatever you think is a desirable amount of sugar and starch, whatever tastes good to you or appears to be a fundamental feature of your life style, you have to know that you don’t need to obtain any carbohydrate from what you eat. 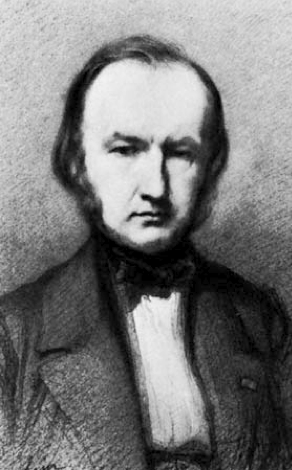 In the course of his experiments, Claude Bernard tested animals that had been fasted, and he soon established the idea that hepatic output of glucose is one of the processes that allows animals to live for long periods without food. (The other, naturally, is the ability to store fat and call upon the fat stores when needed). It is hard to exaggerate the importance of this discovery for people who want to understand nutrition and who want to control their own health. If you think about it, you already knew that you don’t need to take in carbohydrate. We don’t store all that much glycogen. The average person has a storage of energy in the form of glycogen of under 1,000 calories, less than half of what is in normal dietary consumption. Fat storage is typically more than 100 times greater — even with carbohydrate loading, marathon runners run mostly on fat. If you had to rely on glycogen for energy, you would be exhausted in a day or so. If people really needed to consume carbohydrate, they would not come out alive after being stranded in the Andes for two weeks. That there is no dietary requirement for carbohydrate most of us learned in high school, or should have. The dietitians say “carbohydrate is an important source of energy” — your brain and other tissues require glucose — but if challenged will admit that it does not have to be dietary carbohydrate. Sometimes luck is on our side. Sometimes we make the right mistake. Bernard measured the amount of sugar in the portal vein which brings blood from the digestive tract to the liver — it’s not a true vein (red in Figure 6.) He measured, as well, the amount of glucose leaving the liver in the hepatic veins (blue). His original observations showed that there was little or no glucose in the inputs from the portal vein but he was able to identify sugar in the hepatic veins leaving the liver. In other words, no glucose was coming into the liver but some was coming out. This pretty much made his case that the liver was a sugar-producing organ and that glycogen was being made form something else, rather than being assembled from blood sugar. Some of his scientific rivals, however, said that he was wrong, that they had also detected sugar coming into the liver in the portal vein. Figure 6. Liver anatomy. The portal vein supplies blood (not truly a vein; red). 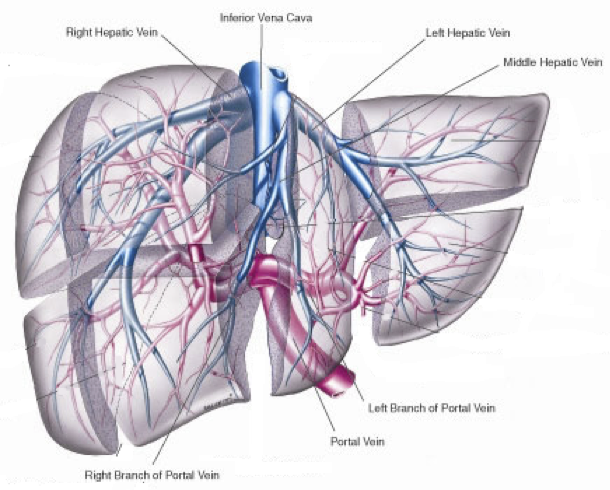 Blood is carried ot the heart via the hepatic vein (blue). They were right, of course — we now know that there is sugar throughout the circulation and glycogen is assembled from blood glucose. Bernard had made a mistake . He had let some of his dissections sit around too long and the sugar in the portal vein had been metabolized. His basic idea was right — usually, more sugar is leaving the liver than is coming in (the liver does produce glucose) but the differences are not that great and, given the methods that he had, he might have missed it. It was his error that led him to the role of metabolism and he had effectively discovered gluconeogenesis. He got it slightly wrong and had to modify his ideas later but he identified glycogen and had inadvertently brought out the idea of gluconeogenesis. Sometimes we luck out. Great article Richard. You’ve helped me understand the process better and the historical context is always interesting. Excellent, as usual. 🙂 Thank you for taking the time. However, after experimenting with myself and my wife’s health on a low-carb and sometimes zero-carb / ketogenic diet (along with frequent blood labs) for over two years, and also researching somewhat on the subject, I have to say I tend to look at P. Jaminet’s PHD requirements for dietary carbs with some respect. Although I don’t agree with the (high) quantities he prescribes (which in my personal opinion justify the relative “chubbiness” of the Jaminet couple), I cannot ignore the effect that total dietary elimination of carbs has on hormonal regulation… especially its effects on the thyroid gland and on the cortisol profile. And with so many people nowadays running into adrenal fatigue, chronic tiredness, and sleep disorders, I conclude that a little carbohydrate is a good thing to have – especially for women, and especially for hypothyroid people. The fact that we don’t know what optimal means would seem to suggest that the paradigm is a little too narrow. “Optimal” probably means an objective feeling of well-being that encompasses the psyche as well as the soma. Another example is the word “cured” which means 5 years without a relapse or recurrence of symptoms, does it not? What about 5 years and 1 week? Still “cured”? Tim Olson, the runner, is the current poster boy for the low carbohydrate regime and he is not without symptoms that seem to be diet-related. Nonetheless, from what is available online, he seems to have found a balance between zero carbohydrates and too many. If I were Dr. Phinney, I would want to take a complete history and a diet diary and get serious about this. Olson might be a legume unique for all we know at the moment. It is well understood that biochemical individuality plays a role in assimilation, but it is equally well-known that “optimal” is a zone of comfort and not a point of contact. If the endocrine system is lazy and assimilation of food is impaired, carbohydrates can provide relief for a malaise as fast as an aspirin can for a headache. A cigarette can boost the endocrine function and improve digestion. A cup of coffee (caffeine/sugar/cream) adjusts the blood sugar and elevates the mood. Liquids taken with a meal dilute digestive juices and slow the process. Sweet, fatty foods can switch on the satiety sense and curb further assimilation. Fats don’t absorb well enough to provide a rapid boost but sugars do. Hypoglycemia can promote feelings of doom and gloom. Low L-ascorbate produces a sense of urgency and a need to acquire nourishment. If these things are taken into account, it is easy to see why a certain level of carbohydrate consumption might be required. If I were a diagnostician, I would suspect faulty assimilation and seek the causes, remembering that the soma needs time to adjust to ketone bodies and that fats harbor toxins which, when released by conversion, can cause Herxheimer-Jarisch-like reactions that produce confounding symptoms and make people run for the sugar. Thank you again for elucidating these important matters. The responses you are getting are thoughtful and relevant, something any good teacher welcomes. Thanks for adding all that. On the point of “optimal”. We could define this as “when all is normal”. Once we introduce an exception – like “if endocrine system is lazy” – then not all is normal. Without looking for the cause of abnormality, all we can hope for from diet then is “when all is as close to normal as we can get”. This makes Richard’s point about therapeutic that much more pertinent. Like so: Establish “when all is normal” in the most “normal” individuals for diet alone, then apply this diet to individuals “when not all is normal”, then whatever is not normal will be that much more obvious, distinct. Through this, we also reduce or eliminate abnormal symptoms caused by a sub-optimal diet. Basically, we call this an elimination diet, first because we eliminate foods that do bad things, but now also because we eliminate abnormal symptoms caused by those foods, leaving us only what’s caused by other things. You gave the example of “if endocrine system is lazy”. It will be lazy regardless of diet, if it’s not caused by diet. So it makes no sense to try to adjust diet thinking we can find an optimal diet for this specific exception. But with an “optimal” diet, we can expose the cause, and ultimately eliminate the abnormality. This gives us a second definition of optimal diet: One which can return everything that is normal back to normal, and expose what is not. Bravo! A tour de force! A really good read about gluconeogenesis. Richard, what are your thoughts on longevous, healthful populations eating a normocaloric high-carbohydrate, low-fat diet? I think specifically of Asian groups like the Okinawans. Perhaps the dietary carbohydrate excess necessarily goes hand-in-hand with a caloric surplus (possibly facilitated by frankenfood “lite” products), without carbohydrates contributing to metabolic pathology as an isolated factor. I don’t think we no much altogether. What we know is that low-carb diets are the best therapeutically as I mentioned in another reply. It is reasonable that they would be part of prevention but we don’t have good data. Also, no reason why different societies or even different people — you don’t have to go to Okinawa to see people who eat the diet that would make me fat but who are very thin. I think people clearly have different genetic dispositions and of course if they are isolate, whole populations may have certain characteristics. Okinawa is an island, right? I’ve just read that 80% of the blood that enters the liver comes from the portal vein and 20% is arterial blood direct from the heart, how the liver gets most of the O2 needed for dealing with the substrates in the portal blood. I never knew that. I did know that glycogen is stored in one zone of the liver, is converted to lactate (this anaerobic reaction I am thinking maybe tops up the ATP spent breaking the glycogen), the lactate goes to cells in another hepatic zone where it is converted to glucose, and then and only then released to circulation. Fiendishly complicated way of doing things, if you ask me, but that’s nature for you. We must always try to disprove our own theories. “We can solidly settle our ideas only by trying to destroy our own conclusions by counter-experiments.” What is observably true is the only authority. If through experiment, you contradict your own conclusions—you must accept the contradiction—but only on one condition: that the contradiction is PROVED. Determinism and Averages. In the study of disease, “the real and effective cause of a disease must be constant and determined, that is, unique; anything else would be a denial of science in medicine.” In fact, a “very frequent application of mathematics to biology [is] the use of averages”—that is, statistics—which may give only “apparent accuracy.” Sometimes averages do not give the kind of information needed to save lives. Thanks for all that. “Sometimes averages do not give the kind of information needed to save lives.” Thou hast said it. Thanks so much! I enjoy your posts and look forward to them all. This was very enlightening! glycogen ➛ G-1-P ➛ G-6-P ➛ glycolysis. We think of the liver as a command center in metabolism and primarily a supplier of glucose. Muscle is a consumer of glucose and any that it stores, it uses in the muscle itself. It’s frustrating how some textbooks not only state that gluconeogenesis happens once glycogen stores are depleted, but imply that this is some kind of last-ditch effort to compensate for the absence of dietary intake of the body’s ‘preferred’ energy source, glucose. Why, one should eat starches and sugars, évidemment…. Children need to be nourished and human breast milk has evolved to be high carbohydrate and very fattening (supplying energy after weaning). The survival value is obvious but it is not necessarily a good thing in the current world. I don’t think anybody knows much about whether there is some kind of real need. I would doubt it but it hasn’t been studied. It’s an interesting evolutionary and metabolic question why galactose is such a favoured sugar early in life, but virtually absent from the adult diet, in mammals. Nobody knows for sure but there is an obvious evolutionary advantage in having a food source that only the baby can use and that the mother’s cells won’t deplete. I was under the impression human milk was relatively low in carbohydrates but high in fat and that breast feeding infants where in a milk ketosis. Richard, we were discussing glucose/glycogen metabolism, and your post here is quite apropos, but it also gave me an idea that might be useful for your work with insulin and cancer. The Warburg effect basically says that dietary glucose somehow increases metabolic glucose usage in cancer cells. However, in the discussion of glucose/glycogen metabolism, I came up with the idea that dietary glucose is primarily converted to glycogen before it can be used as glucose at some point down the line (from a piece of obscure research I can’t find at the moment). When I combine the two ideas, I get the idea that somehow cancer cells cannot do glycogenesis very well, if at all. There’s several implications to this idea, starting with the suggestion that glycogenesis is an inherent function of mitochondria, and there’s an upper threshold to how much glycogen can be stored in most cells other than hepatic cells. When this threshold is reached, those cells switch from primarily glycogenesis to primarily glycolysis, either way driven by insulin/dietary glucose. At some point, they get stuck in glycolysis, and we go on from there to explain what happens afterwards. Finally, cancer cells do not have an intra-cellular fuel tank (unlike muscle cells/glycogen for example), all their immediate energy needs must come from outside. Do you think there’s anything to this idea? You raise a number of interesting questions which I can’t answer quickly. One point is that not all cells normally have glycogen metabolism. Also, I think that glycogen metabolism is cytosolic, not mitochondrial. But let me think about it. It does seem strange that people would recognize dietary carbohydrates as a non-essential macronutrient while making the argument that an optimal level would still appear somewhere above zero….could you please help me understand this? I’m thinking of this in terms of low-carb critics pointing to sub-optimal sports performance and/or thyroid dysfunction as common problems. Crying wolf is bad. The Institute of Medicine, which I assume is what you are referring to, are so biased that it is hard to know when they are making sense. They are right that we don’t know what an optimal level of carbohydrate is, but we don’t even know what optimal means. Despite my good feelings about the Paleo people, we did not evolve according to some ideal diet. We evolved to be flexible. If you think anecdotally, for a professor who does little physical exercise (compared to paleolithic times when we might be running from the lean meat’s mother), some of my colleagues don’t feel good if they have less than 100 g of carbs a day. I don’t feel good if I have more than 100 g of carbs a day. I suspect that there is the same individual variation in sports performance. What we know, in the extremes of competitive sports, is that starting from scratch, that is, from standard baseline diets, Jeukendrup’s studies clearly show that athletes do best on high carbohydrate diet. On the other hand, Phinney has alsoy shown that if you allow a keto-adaptation period, there is no loss and may be benefit in performance on a ketogenic diet. I agree that claims to ideal diets are ludicrous as they assume a level of certainty in our biochemical knowledge that clearly isn’t yet possible. A good definition of a Paleo diet must include the characteristic of ‘flexibility’ (adaptation to the variation of nutrient type and its availability). Exclusion of this characteristic from the definition is a dismissal of empirical evidence provided through the study of the Kitavans to the Inuits and all others in between. Furthermore, a Paleo diet should not exclude the possibility of humans benefitting from a micro/macronutrient that we may not have encountered during the Paleolithic (novel foods are no guarantee of adaption problems, but remain likely candidates). The idea that we ‘feel better/worse’ over or below a certain level of dietary CHO intake could indicate that the rate at which our livers carry out GNG to support us factors in. Do you agree? What specifically about the GNG process could account for our individual ‘feel good’ level regarding dietary CHO intake? I meant to comment on this entry when I saw it, but was side-tracked by the va-et-vien. It is my conviction that because of the rigors of civilization, we are all a little ill. Dr, Phinney calls it ‘constitutive inflammation’ (Phinney, SD et al). Thus, we sometimes need patches to get us through the day. One of these work-arounds is the lowly carbohydrate. When the usual metabolic processes are impeded by our habits of diet and hectic schedule, we get a yen for a fix to stimulate the sluggish progress of our metabolic processes. The simple carbohydrate assimilates quickly, sometimes in the mouth, and catalyses the reactions that keep us on an even keel. Other edible items that do the same thing are, coffee, tobacco, ice cream, breakfast cereal, chewing gum, sodas and chocolate. In part, these are carbohydrate sources, but they also contain other factors as well, including stimulants that affect the endocrine system. The CO2 in a soda is a potent driver. Besides that,chronic dietary deficiencies can give us a periodic “all gone” feeling (Smith, L.) that urges us to seek compensatory nutrients, some of which might be off the mark, healthwise. In our caveman days, hypoglycemia triggered the urge to initiate a hunt in search of nutrition. Nowadays that same urge can steer us to the baked goods aisle. The milieu interieur senses lower glucose levels but our reactions are not always directed at the specific deficiency. In this case, evolved intelligence should direct us to a good choice but sometimes the ubiquitous bad choices bring pleasure, a hard sensation to deny. Clearly, the food processors know of this because they give us an endless variety of snacks that address this very problem. I heard a song on the radio the other day that recited virtually every snackette imaginable with no repetitions and it was s 5 minutes long! Egad! We’re surrounded by bad choices within a culture of free will. Good luck! That said, most people know what they’re doing wrong and can stop it any time they want to. It’s mostly a matter of getting over the withdrawals and the Herxheimer reactions (Walford, R.). Dr. Libbey figured that one out and patented it (Libbey, AF). My son (#2) eats his hamburgers between two layers of iceberg lettuce instead of a spongy bun. That’s progress and it tastes good! Also, is it possible to estimate what the minimum necessary level of dietary CHO intake is to replenish ones liver and muscle glycogen stores? GNG will not allow our muscle glycogen stores to drop below a certain level (not sure how much though) but also (it seems) won’t fill top us off unless their is some dietary CHO intake. Why? I don’t think these questions can be answered easily. It depends what you mean by replenish —— glycogen is continuous. As you say glycogen will respond to total input including dietary carbohydrate and will be lower if dietary carbohydrate is lower. As in other processes, insulin is a major factor but all that is, is a response to metabolic conditions, not good or bad. We think of glycogen is good because of endurance training but it is a storage form of energy like fat and too much is not a good thing and reduced glycogen is a reflection of lower insulin flux. This reasoning underpins the concept of High Intensity Training (anaerobic exercise); it is argued that its characteristic cascade effect of muscular glycogen cleavage is desirable because it has a hand in reducing insulin resistance. We want to keep the flux down but beyond that I don’t think we can make deductions on just this part of the system. Remember, “flux” means time and there are times when you want insulin high and glycogen high. The system is sufficiently complicated that we don’t know how GNG (that is the key enzyme PEPCK) supports GNG. In other words lots of things are going on at once. Once we go too much beyond the basic ideas, I’m not sure we can predict much. For a good picture of what’s possible in “high intensity” training, check out super mouse: http://www.youtube.com/watch?v=kGrdsedQB9o (music is not too good). The study: 1. Hakimi P, et al: Overexpression of the cytosolic form of phosphoenolpyruvate carboxykinase (GTP) in skeletal muscle repatterns energy metabolism in the mouse. J Biol Chem 2007, 282(45):32844-32855. Having said that, let me add that I do not suggest that caffeine, sucrose and lipids will cure a lazy endocrine system any more than a crutch and a bandage will cure a leg weakened by diabetes. Similarly, headaches are not caused by an aspirin deficiency, but most likely a dietary preference with unknown side-effects. A sense of well-being is a reflection of an optimal dietary regime and because of biologic feedback, one of its causes also, I’m sure you will agree. One of the downsides of a diet containing too many simple carbohydrates is somatic acidification. Any biochemist can tell you that. The rub is that high protein diets also cause acidification because we modern Homo sapiens living in New York tend to ignore the really nutritious parts of the animals we eat and focus on the muscle parts. The Eskimaux (Inuit People) give us a window into our past dietary habits and they leave that stuff for the dogs because steaks make people sick. If we made a point of eating the stomach contents of the ungulates we harvest, we’d get all the fibre we need. Yuk! As to the effects of fat on the pH of the soma, we’d have to be a little more specific. What kind of fat are we eating? Is it the kind they used to make candles with or is it the kind that bovines make when they have plenty of sun soaked vegetation to browse and ruminate? Is it heated, oxidized and solidified for convenience or farm fresh and free of additives? The reason I mentioned Timothy Olson, the runner, before is because he has gone public with his dietary preferences and won some mighty tough endurance races by finding a magical balance between proteins, carbohydrates and fats. That’s also why I would like to see someone skilled in the art discover exactly what he is doing to make this happen. If I looked like him (I don’t) I think I could say I am doing something right and should continue on with my practice. He might be inclined to protect his competitive edge, but he strikes me as a humanitarian. He likes babies. I go where the evidence leads. Trying something for a couple of weeks and then saying it doesn’t work is hardly the scientific approach suggested by Bernard and his colleague Bechamp, especially when it comes to homeostasis (“optimal state”) in the human soma. Our internal chemistry is hard to alter once it becomes established by habit. Overcoming one’s dependence on simple carbohydrates to maintain one’s kilter takes a good deal of effort and some help from one’s friends who must expend extra effort and refrain from ridiculing an abnormal diet that contains no diet soda or ketchup. I think you are overstating the acid/base balance issue in terms of how strongly our dietary intake can influence this homeostatic process. Our body does not have much of a margin for leaving its pH comfort zone and must thus regulates it very tightly – regardless (to some extent) of what we are feeding ourselves. EVERYTHING pretty much affects our endocrine glands and other tissues…but that doesn’t mean everything is manageable through diet alone..
Also, multiple studies have repeatedly shown that high-protein diets are associated with fewer fractures,squarely contradicting the mechanistic reasoning typically used to explain how we regulate pH by pulling bicarbonate from our bones (amongst other mechanisms). Timothy Olson is wonderful and should be encouraged. However, it is very premature to credit the majority of his results to his dietary habits. People have won much more on terrible diets. I’d guess his diet will be of greater help to him in terms of health and longevity (reducing inflammation, joint wear and tear, generalised oxidations etc) than purely performance wise. At this level, genes really do matter a great deal as these are the ‘best of the best’ which we have already selected (through competition). Thank you for your forebearance; feedback is the only way I can test my clarity. Certainly, Prof Feinman finds our 2¢ worthwhile in that sense. I rely on his wisdom to curb errant inaccuracies. My understanding of the acid/base question goes back to Bernard who was famous for his term “milieu intérieur”, meaning the conditions within the soma that contribute to optimal health. He led the way to an understanding of the ability of the structures and processes to maintain what has come to be called, “homeostasis”. A blood test will reveal where within a band of normalcy anybody’s serum pH falls and it is a range, not a line, which has been established around 7.35-7.45. Anything above is alkalosis. Anything below is acidosis. The difference isn’t much but, even if it’s wrong (too high or too low) the body sense will do it’s best to keep it there. That was my point. To move it one way or the other takes more than a dose or two of bicarbonate of soda…much more. I have read a study that says cesium chloride can alter pH abruptly but it is by no means definitive. I don’t argue with the biochemists; they say that dietary preferences can raise or lower the pH over time. Orange juice and chocolate cake seem to have opposite effects even though both contain sugar. I have studied the effects of various food preferences and agree that a high protein diet will build strong bones. If calcium were the only element in a strong bone, I would concede your point. Before I could expand beyond that, I would have to know, ‘compared to what?’ The tea and toast diet is known to cause spontaneous fractures even when a calcium supplement is being used and hypercalcemia can cause as much distress as hypocalcemia. Our ancestors used the bones for stews and leached out the calcium in an easy-to-assimilate form. We seldom do that anymore. I do go along with Mayer, Seltzer et al who show that somatotypes are probably hereditary. Timothy Olson got a good one for a a runner or maybe he was drawn to running because of his physiology; I can’t say. Before I went further than to point out that his finish 15 minutes ahead of the pack in the Western States [100 mi.] Endurance Run was unprecedented and would make anybody turn and ask, is he a Superman?, I would want to sign him up for a longitudinal study because I think we could learn something valuable from his practice and how it will affect him over time. He says he uses little carbohydrate food…not none. He trains daily under all conditions. His wins are proof enough of that. He is consistent, and that places him in a league where the one-hit wonders are absent. If were a diagnostician, I would say that he has what it takes, like an Inca courier. Inflammation is a pesky problem, I agree. The cognoscenti use the term ‘constituitive inflammation’ by which they mean that there is a common underlying condition whose cause they do not know. Olson has mentioned complaints online that are probably related to a mismatch between his intense exertion and his nutritive intake. Exactly what will bring him up to optimal condition, I don’t know. I’d need a history and a diet diary…so far unavailable. He’s pretty close to optimal now, in my humble opinion. As to genetics, they surely have a role to play but when all is said and done, the effect is pretty small. We Homo sapiens can produce a multitude of variations on a theme, but the theme is pervasive. Simians have much more in common that we care to admit sometimes. Can you tell the difference between #1 and #12 in the Miss America contest? I can’t. Vasco, please consider that low-carbers might actually have normal thyroid function (especially T3) and that high-carbers skew the ‘normal range’ toward something higher than optimal. Lower serum T3 may, in fact, be optimal. As to cortisol, who knows? I suspect most who claim cortisol problems have never actually been tested. Now, that is an interesting thought, Over 60. 🙂 It had crossed my mind, but with so many well-informed people hammering that nail, I felt I was going into a dead-end. Cortisol is probably more a function of other dietary and environmental cues, like adrenal stimulants and sleep habits (chronic morning coffee, excessive intermittent fasting, shift work, late TV, etc. leading to adrenal fatigue and/or pattern inversion), than it is of carbohydrate consumption. But since I know of a bunch of young women with Hashimoto thyroiditis, I worry that a low-carb diet may be helping convert too much T3 into reverse T3, which only makes their already T4-overloaded systems (by doctor’s orders) more stressed. I’m sorry to be hijacking the post here, but like all else when it comes to health and biology, the matter is complex and dynamic, and blood glucose is but the tip of a very large metabolic iceberg. Sure, we’re really happy to have the health and stable energy that comes with eating real food and excising the “crap-in-a-bag” feeding habits we are educated with since childhood, but I have a painful conscience that “optimal” is still something we are trying to identify… and that radical decisions like extreme low carbing (a.k.a Petro’s “hyperlipid” style, which I personally favour) must be accompanied with close and continuous monitoring because we just don’t know what’s behind that big hill in the horizon. Richard, my comment is off-topic, but I think I have another idea that could be useful in your work on KD/cancer. Ketones act as signaling molecules in chaperone-mediated autophagy, the recycling of glycated protein inside cells. Maybe ketones could act as signaling molecules for other functions. I had read another paper that said somehow ketones regulate their own metabolism once they enter the cell. But only now do I think I found how they do it – through shutting down insulin receptors. It seems contradictory at first since insulin resistance is blamed for diabetes type 2, but bear with me, I believe it’s very sound logically in all pertinent ways. In those cells which require insulin to take in glucose, there’s less glucose coming in. In those same cells, there’s also less insulin coming in so metabolism shifts toward fatty acids/ketones oxidation (also probably ketogenesis in cells capable of it). Of course, the whole thing has to start with insulin, and this means the liver (but you might also say the pancreas). I say the liver because that’s where the bulk of ketogenesis occurs, and the source of ketones in the blood. The blood, where we start our ketone signaling sequence. Ketones regulate their own metabolism by shutting down insulin receptors once they enter cells, blood insulin level is regulated through a long feedback loop from the liver to individual cells (and back again), which then regulates ketogenesis at the liver, ketones are dumped in the blood according to this long feedback loop. All the while preserving intracellular glucose (glycogen) for glucose-dependent functions, and preserving blood glucose for glucose-dependent cells. What this means for your work therapeutically, Richard, is that the most likely reason subjects don’t respond to KD is that the liver is insulin resistant. It’s just an idea, of course. If Prof Feinman needed a prod to write us a paper on ketone bodies, this is it! As a master of “off topic discourse”, I admire your pluck; as you described the putative metabolic process, I was able to visualize it, no small feat. Are you aware of the work with insulin secretion/suppression of Wells WW et al at M.S.U.? As in many other things, it is hard to isolate a single component. In the ketone body metabolism, a key player is succinyl-CoA which regulates ketone body production by covalently succinylating the synthetic enzyme and, is the reactant in the utilization of ketone bodies (acetoacetate + succinyl-CoA –> acetoacetyl-CoA –> acetyl-CoA). Succinyl-CoA itself, however, is a feedback regular of the TCA cycle itself (down regulates citrate synthase). So regulation by ketone bodies in general is good principle but regulation of insulin receptors is unknown to me. Thank you; biochemistry is fascinating, isn’t it? My personal take on ketone bodies is that they are the preferred fuel within the soma. I liked the reference to the sugars as jet fuel (q.v.). I think glucose, in particular, is a metabolic intermediary and that fructose (e.g., berries) is a vestigial hibernation storage pathway. At least one full, tenured, emeritus professor from Cal disagrees with me on this point. Stay tuned. I found these papers to be particularly useful. It took me a minute (or two) to mentally metabolize your description. I was reminded of a paper I read that I am still trying to relate regeneratively to what I think I know. I hope I’m still coloring inside the lines. I don’t want to lose the group. If requested, I can post an abstract. I try to keep fairly loose lines. The citation is important and I will discuss ketone bodies in detail in future post. OK, so ketones can regulate self through TCA cycle directly, at least. This makes sense because there’s no storage capability for ketones; they are meant to be used immediately once they enter the cell. This self-regulation of ketones at the TCA cycle, combined with the exclusive lipolysis/glycolysis either-or metabolism – if all other things are equal, then glucose (glycogen) will accumulate, or at least not be used up when ketones are being oxidized. If we assume this is the picture at the lower end of dietary-carb spectrum, how does it work for the upper end of the same spectrum? I believe glycogen will act as regulatory molecules (though perhaps not through direct signaling), also through insulin receptor modulation, also through blood insulin level, also through this same long feedback loop. This gives us a positive correlation between dietary carbs, BG, blood insulin level, and glycogen storage level. It also gives us a greater degree of significance for liver glycogen storage level, and liver insulin resistance, also pointing to the liver as the source (or the target) of our therapeutic problem at the upper end of this dietary-carb spectrum, especially with diabetes type 2. For this particular condition, we’re also looking at intra-hepatic fat (i.e. fatty liver) as yet another major regulatory element of insulin, also through insulin receptor modulation. Now imagine that no matter where we are on this dietary-carb spectrum, if we still can’t get insulin to go down, and/or if we still can’t get ketogenesis to pick up: It always points to the liver. Again, just an idea. Okay, so what about liver metabolites like 3-Oxo-L-gulofuranolactone? Stephan Guyenet skeptically examines the concept that carbohydrates are central to understanding the modern epidemic of obesity at http://wholehealthsource.blogspot.ca/2011/08/carbohydrate-hypothesis-of-obesity.html. It is worth reading and has made me question my own judgements and beliefs about the role dietary carbohydrates play in metabolic syndrome, obesity and type 2 diabetes. 1) While some randomized studies and other nonrandomized clinical studies do suggest carb restriction is effective at ameliorating diabetes/metabolic syndrome/obesity, most of these studies also induce a caloric deficit, promote physical activity (ergo energy expenditure), and recruit highly willing volunteers (not representative of the general population). 2) Despite the burgeoning epidemic of metabolic syndrome, the amount of carbohydrate in the national diet has not changed appreciably over the past 100 years, according to USDA data. Proponents of the carbohydrate hypothesis invariably respond by attacking this data source, rather than re-calibrating their beliefs or resorting to alternate data sources. 3) Aboriginal cultures on several different continents retain very fit and lean physiques despite diets which are largely carbohydrate-based. Since we share genetic ancestry with these individuals, it is unlikely that we, uniquely, are maladapted to carbohydrate-rich diets. 4) Finally, there are other scientific hypotheses that can be invoked to explain rampant obesity and metabolic syndrome in western society (including skyrocketing rates of type 2 diabetes, which may be partly due to ever-lower diagnostic cutpoints for fasting blood glucose as well as greater diffusion of population-wide screening – i.e. “diagnostic artifact”). It is not time-efficient to get into these here, but a total focus on carbohydrate metabolism to the exclusion of all other (“unhelpful”) experimental data will probably mean that any attempt to fix the problem simply by reducing dietary carbohydrate input will be limited, as it reduces a complex problem to a single, simple cause (something we humans love to do). There is no lack of skeptics of carbohydrate restriction. What we need is some constructive way to move forward. I will answer your comments. Overall, low-carbohydrate diets have made their case. It is the default (one to try first) for diabetes and metabolic syndrome and nothing is better for weight loss. But if you’ve got something that works better, go for it. I don’t agree with the generalization but everybody has to integrate the studies for themselves. “Highly willing volunteers” are what tells you the potential. If you are not highly willing, you shouldn’t go on any diet. Maybe. Maybe not. But during the last 45 years during the epidemic of metabolic syndrome, almost all the increase in calories has been carbohydrate. I am not attacking the data source, but then again I am not a proponent of the “carbohydrate hypothesis,” whatever that is. “Invariably” is not a good word in this field. Who are you attacking? We are not an aboriginal culture. This is goddamned stupid. You can get away with crap like that if you are a chair of medicine and your friends are on the editorial board. Our genome has 95 % homology with chimpanzees and it is not even clear how much genetic ancestry I share with Walter Willett. In any case, low-carbohydrate diets are primarily therapeutic. Obesity and diabetes are a maladaption to something. They usually get better with low-carb diets. Sorry to have bothered you. The article you recommended, however, is not a concise read. If you are attacking somebody, you should say who they are. I don’t actually recommend anything. Science says that some form of low-carbohydate diet is the default (one to try first) for diabetes and metabolic syndrome and nothing is better for weight loss. If you’ve got something that works better, go for it. I, of course, don’t mean you, D6, but before you question your beliefs, make sure that the skeptics are interested in really finding the answer and are giving you real questions to analyze. 1) Mediterranean/Cretan; 2) low carbohydrate, high fat; and 3) low fat vegetarian (a la Ornish/Esselstyn). I can make suppositions about which one would win based on cardiovascular events but I don’t think I’ll ever see such a trial in my lifetime, because the proponents of each approach relentlessly antagonize each other and are unwilling to work together for the sake of science. Thus the expertise required to design and implement each arm would not be there without a collaborative approach. Patients are the ultimate victims of this viciousness between academics, since clinical science will then stay ‘ignorant’ of the truth. Everything that has come to date has been animal data, randomized trials with biomarkers but not hard events, experimental feeding studies, ecological comparisons between tribes and nations, observational studies which are highly prone to selection bias and hidden confounding. I am not saying some of these data aren’t informative (they are), but the looming question mark still hangs over the entire field. Ironically PREDIMED just adds greater confusion, as the letters in this week’s N. Engl. J. Med attest. NIH/FDA/USDA/HHS/NIHLBI need to corral some people into a room the way they did at the beginning of the cholesterol controversy, which resulted in MRFIT, LRCCPT, WHO and CDP being performed (the controversy did, anyway). This question is doable within the same timeframe it took us to get to the moon, and unlike the latter, it has real scientific impact and merit. The more polarized the field, the less I believe that the evidence base is credible, conclusive and definitive. When something “obviously works”, most people will start to prescribe it (aspirin, statins, beta blockers). Clearly we still have knowledge gaps to work on, folks. More telling as a metabolic parameter is triglycerides. The trial published values for CHO at different time points. I plotted those against triglycerides. The results also shown on Pinterest. We don’t need any more studies. We need to understand what we have already. Of course, I meant we can always use more research but we have enough information to provide good guidance who, as you say “are the ultimate victims.” However, the “viciousness between academics” is not at our end. 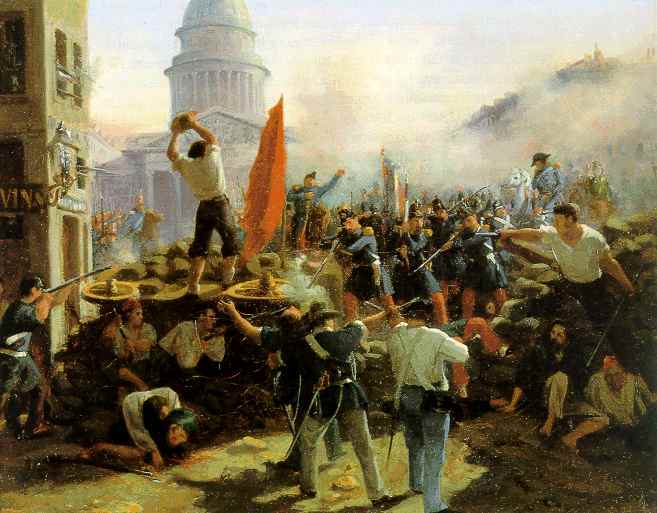 The people corralled were the people who were in agreement with each other. The studies you cite didn’t need to be done and failed as predicted. I have suggest a corral to NIH and many others but the corral had to include all sides of the story. I don’t see it on the horizon. In response to D6’s par. #2: Perhaps one could postulate that carbohydrates today are not those of 100 years ago; and sugar consumption has increased tremendously over the past 200 years. Sugar: The National Geographic published an article about the fascinating history & consumption of sugar – the more we taste, the more we want. “In 1700, the average Englishman consumed 4 pounds a year. In 1800 the common man ate 18 pounds of sugar. By 1900, he was up to 100 pounds a year.” – “Today the average American consumes 77 pounds of added sugar annually, or more than 22 teaspoons of added sugar a day.” Those numbers don’t include high-fructose corn syrup (hfcs), which Americans consume 51 pounds annually. 1) During the agricultural revolution, most people had to do manual work for a living. With the advent of the industrial revolution, more and more moved to cities but still manual work was the norm. During the current information revolution, one can be completely sedentary and work on a laptop computer from home (as I did today). Thus the wholesale nature of work has changed completely. It used to be that only the very upper tier of society could afford to get fat. Modern conveniences such as the automobile and television virtually ensure a net positive energy balance. 2) Industrially processed food, which most people in our society currently eat, is so much more appetizing than it was 100 years ago. And so much more convenient. Did pizza delivery services exist prior to the past 30 years? There is extremely high “food reward” from modern food rich in fat, sugar and salt – far more than say whole foods or simple one-ingredient foods. Refined carbohydrates are a big part of this, but not the only part. 3) Modern medical care has ensured that obese people live longer, as physicians have gotten better at treating the end-organ complications of obesity, rather than the causal factors themselves. Hence obesity as a proportion of the general population has increased. Competing causes of death (e.g. from cigarette smoking) have concomitantly decreased. So we are far more inactive, eating very high-reward, high calorie foods and successfully treating our longevity-limiting diseases with pharmacotherapy and surgery (eg bariatric surgery, knee joint implantation, surgery for obstructive sleep apnea, cholecystectomy for gallbladder disease). What does this mean? It’s a perfect storm or recipe for an obesity epidemic, which is a tangle of all these causes. Unravelling this is difficult without highly motivated patients and committed health care practitioners. Have you considered therapeutic use of intravenous ketone administration? The idea just occurred to me so I did a quick search and found there’s very little research done on that. The most pertinent I found is applicable to brain injury. I understand that your work on KD/cancer is focused mainly on insulin signaling, but I believe the therapeutic effect is also due to ketones. Basically, the idea is to use intravenous ketone administration to kick start insulin regulation, and thus achieve the desired effect in those patients who do not respond to KD. If we assume that my previous ideas about ketone regulation through a long feedback loop are correct, then we can also hypothesize that altering blood ketone level directly through IV will have a regulatory effect on insulin receptors, blood insulin level, and ultimately insulin signaling down the line. This assumption is easily accepted since ketones are end-point molecules: There is no ketone storage capability, they must be used immediately (or excreted), so there must be a way to regulate ketones, and/or ketones act as the primary regulator for themselves and the other fuel substrates. The mechanism is liver insulin receptors, which would open up as blood ketone level rises, for the purpose of regulating ketogenesis at the liver. What this means therapeutically is that blood insulin level should drop, and blood glucose level should drop as well, thereby depriving glucose-dependent cancer of both energy and signaling. There is somewhat of a precedent here with diabetes type 1, where there is exquisite insulin sensitivity, combined with runaway ketogenesis at the liver. The insulin sensitivity could be seen as an attempt to regulate ketogenesis, supporting the idea of ketones regulating themselves and the other fuel substrates. I am very impressed with the quality of your thinking. Keep it up! Consider this: if blood sugar could be lowered consistently, would not the natural production of ketone bodies be enhanced through the natural biochemical pathways in response? Calorie restriction works best when the subject is in a Faraday Cage. Can you think of a way to reduce blood sugar without overloading the system with insulin? Is there a pathway to which one could divert surplus glucose to other vital reactions? Dietary fructose could constitute a complication. Alfonzo, look at it this way instead. If ketone regulation is normalized (either from too-low or from too-high) blood glucose has no choice but to drop. This is because ketone regulation requires the action of insulin at the liver, which will inhibit ketogenesis as well as glycogenolysis and gluconeogenesis at the liver. I wrote a blog post (title: Paradigm) that explains the long feedback loop at length in all pertinent ways (click on my name to view). One of the links Richard posted in his last comment confirms some of the predictions experimentally in rats. Bear in mind, this is only as I see it, not necessarily how it actually works. There seems to be no question that metabolism rules Homo sapiens and as to what rules metabolism, we seem to have, at a minimum, two choices: ketone bodies and glucose. If what I learned in High School is 50% correct, Mankind transformed from a dumb brute into a professor of medical sciences literally overnight, in geologic terms. What accounted for this transformation? The role of insulin must be included as it provides the combination to the receptors that ketones and glucose must satisfy before they can pass safely. What else does insulin do? I know it interferes with (blocks?) HGH and that’s my clue that it has other functions besides the ones I learned in Health and Personal Development. As you might have noticed, I am not delving into the intricacies of the somatic pathways that enable the processes to occur. I am looking at it as an architect, not as an electrician. So, to me, it seems that you might be able to enlighten us further just based on your previous contributions. Perhaps you, Prof Feinman, have had some thoughts along this line also. Bernard’s view that the Milieu Interieur has a bearing on the health of the animal must also refer to mental powers and how they are applied to the problems of survival in a hostile environment. What I suggest is that the new power might have some problematic side-effects that today we call disease. If so, can we ameliorate disease without interfering with the overall success picture of the patient? For example, what if a sodium-blocker causes Alzheimer’s Disease or a blood-thinner causes memory lapses? I will read your explanation but what I am getting at is this: assuming that the whole world hasn’t yet adopted a version of the Atkins Diet, where is all the glucose going to go? As it is, we run it off, sweat it off, multitask and convert it to adipose. That is my point about serum glucose; except for Dr. Walford’s Draconian Caloric Restriction Regime, any known diet will produce more glucose than the soma requires to function. Your approach assumes that somehow people can be trained to curb their appetites and convert exactly the right amount of food into exactly the right amount of glucose to stimulate exactly the right level of ketone body production. On this planet? That said, Dr. Walford had no compliance issues with his mice. Your MD is lacking in mathematical skills. That may well be; I’ll let him defend himself. Doesn’t sound like my kind of book but I did leave a comment about general questions in nutrition. Dr. Young [PhD] also answers the question “when does disease begin” to which the usual answer is, ‘when the insurance code is determined’, and cites Dr. Guyton, M.D. who is hopelessly old-fashioned* even though he’s still right on the money. * Back then, we had toast… Sienfeld, J. You have maintained your usual high standards but I am not sure what you are talking about. I am not an MD and Bernard’s treatment of animals is widely known to be very different from current standards but I don’t understand the point. I meant no offense and am sorry for any I have caused. I think the reply got out of sequence. I am talking about Dr. Robert Young’s co-authored book which I included as a reference, in error, as a URL and it morphed into an actual book cover courtesy of WordPress. You commented that it wasn’t your style and I replied, (au contraire) that it contained a good deal of scientific fact about Claude Bernard, the subject of your essay and this blog. I then pointed out that Bernard’s work is largely absent from the modern medical curriculum and your long essay about his contributions to medical science was clearly a departure from the norm, which I applaud. Obviously, you are not an M.D. because no M.D. I know of could write such an essay. In your bio, I recall that you describe yourself as a biochemist, someone more likely to be familiar with Bernard’s contributions to the foundation of Modern Biochemistry (including the study of animal physiology). The Dr. I referred to in my comment about informed lifestyle advice being good for an M.D.’s business was actually Dr. John Christopher, a practicing physician, and not Dr. Robert Young, a nutritionist and a PhS., N.D., not an M.D. as I stated. When I was writing my comment I confused the two and sought to correct my error but seem only to have added confusion. The fact that Dr. Young writes extensively about Dr. Bernard is the God’s work I mentioned, in the sense that my error was nonetheless directly on point. I think you would find much of value in Dr. Young’s work. As to Dr. Christopher, a Mormon, he felt that a physician had a duty to know his patients very well before suggesting a course of therapy and in that respect, he was quite inefficient by modern standards. I am not a Mormon but have familiarized myself with their belief system and can say that his style of medical practice is supported by scripture in the most specific way. In order to be true to his faith he had to follow it to the letter. When I used the term, “vivisectionist”, it was in it’s scientific sense and not its political context. To me, it’s not a “bad word” and I have no particular views about it except that sometimes animal experiments are too freely converted to human results in the popular press. I was not thinking of the destruction of the Animal Labs at Oregon but rather of the well-known fact that Bernard’s wife was at the head of the anti-vivisectionist movement in France and divorced him when he wouldn’t mend his ways. Your historical approach to the subject reminded me of that bit of science lore which only underscores his important legacy in the face of much resistance and personal sacrifice. Sorry, right file, wrong Dr. As you see, Dr. Young is a PhD. The Dr. I was thinking of is Dr. John Christopher. I should have consulted the Heralds before I identified him as an M.D. However, my characterization of his approach to medicine is correct. My point was that Dr. Christopher saw his mission as healing the sick, not maintaining health from conception to old age. He was a healer, not a guide to “wellness”. To me, this is a limitation that is inculcated in all the board certified healing arts ab initio. Unless one is ill, the medical profession can’t help much. I don’t think there is a CPT for “perfectly fine” and you can’t expect an M.D. to work for free. I recall the time I took my first child in for a “well-baby checkup”. Remember those? The pediatrician (YNHMS) had no idea what I was doing there, exposing my baby, who was perfectly fine, to the hazards of the waiting room. I wrote a check for the receptionist on the way out. Later, the smart physicians took advantage of the well-baby visit to update the inoculations card.